Unfortunately the "Free Tide Laundry Detergent Samples" offer is no longer available. 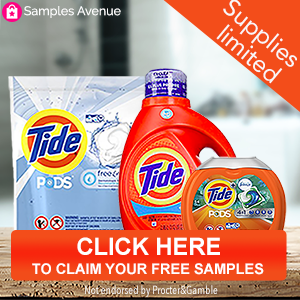 With Samples Avenue, get access to free samples, coupons, and free stuff. It's your opportunity to try out new products for free. They are currently offering free laundry samples. Sign up to receive free Tide Original, Tide Pods with Febreze, and Tide Free & Gentle in the mail. I don't use Tide. But I am willing to try!